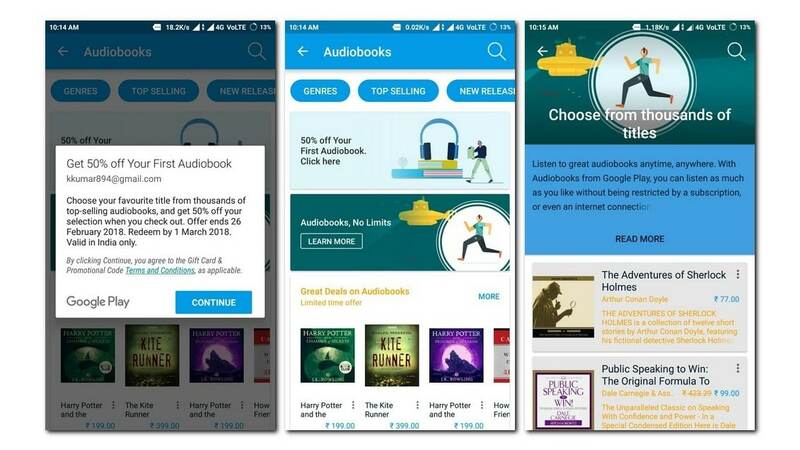 Google Audiobooks launched in 45 countries last week and Google Books is the primary way you purchase and listen to them. Google has a wide array of titles from major publishers and the prices range from $12 to $35 per title. Not only are audiobooks compatible with the Play Books app, but you can also listen to them in vehicles that have Android Auto. Today Good e-Reader takes a look at the Google Play Books app and all of the new audiobook functionality. It has basic features such as being able to adjust the playback speed and also a sleep mode, where the audio will stop after a certain duration of time. This is useful for when you are listening as you are falling asleep, so you won’t miss anything. Shopping for audiobooks is a breeze, within the Play Books app there is a new tab next to books, called audiobooks. There are thousands of titles from all of the major publishers, so you will find all of the latest bestsellers, in addition to classics like Alice in Wonderland. When you click on a title it lists things like the narrator, publisher, length, similar titles and user reviews. Since audiobooks are new, most titles have zero reviews, so it might be difficult to find something good. Overall I think Google Audiobooks is a solid first step, but the audio player needs some work. I would like chapter navigation to be more intuitive and a built in system to attach bluetooth headphones or a wireless speaker. The design is also a bit clunky, you constantly have to hit the soft key back button and other times there is a back button built into the UI, in the top left corner. It should have been a category in Play Music.